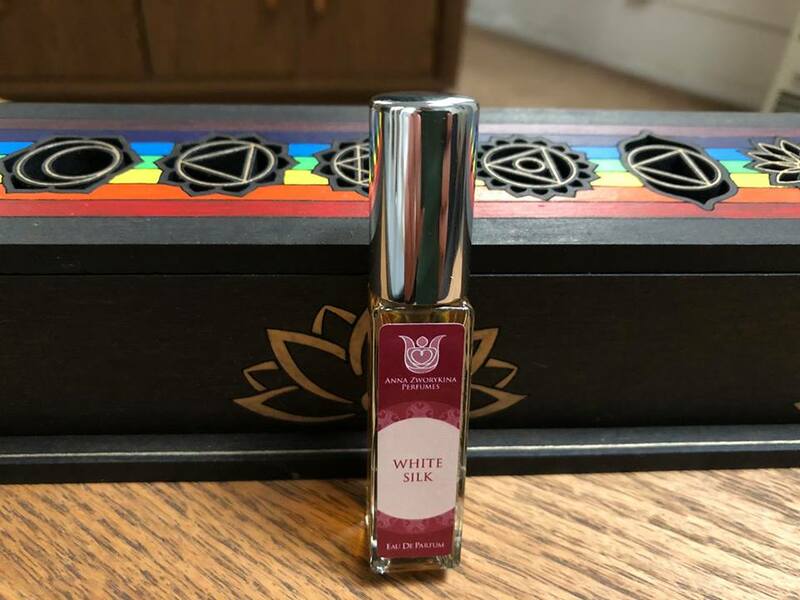 «From Moscow, Russia to my residence in it’s sister city of Moscow, Idaho USA, I’ve received my bottle of White Silk by Anna Zworykina Perfumes. A fresh, bright citrusy top adds zest to the dried floral essence of perhaps a tea or potpourri. Rose, jasmine and osmanthus are the suspects in this gorgeous smelling tea. Tuberose and vanilla add a creamy effect and sweetness to the delicious tea. Jasmine sweetens the tea and osmanthus adds a delectable fruit flavor. Iris helps contribute some powder. I get a warm, spicy effect throughout this fragrance. Even though there’s no listed spices. Next to the citrusy, floral tea, there’s a prominent sandalwood incense. It’s a woody, incensey scent profiled sandalwood that’s fantastic and blends phenomenally with the florals. Labdanum gives a balsamic effect to the incense, woody aspect of White Silk. Mildly rosy rosewood is also a woody note. Musky, animalic, indolic notes are created by the jasmine and some botanical musk in the form of ambrette. I believe this is an all natural fragrance. It’s ravishing!» — amazing review from Craig Karoses!! !